Yesterday was an emotional day. Despite several requests, we couldn't get a carload o' kittens delivered to the Refinery29 office. At the time, we may have used words like "heartbroken" and "disappointed" to describe our feelings, but as we sit here this morning, facing a day without even the hope of kittens, we realize that we can't even begin to describe our true pain. 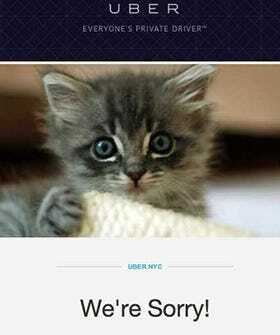 To soften the blow of a feline dream dashed, Uber offered a $10 account credit to select customers. The message accompanying the credit notification reads, "We saw that you requested UberKITTENS, and we weren't able to deliver the precious snuggles." The start-up claims the "demand for KITTENS was much higher than expected" causing many a sad face in Manhattan. The credit is good until November 29, and Uber suggests stopping by the ASPCA to visit the kittens, or even adopt one.